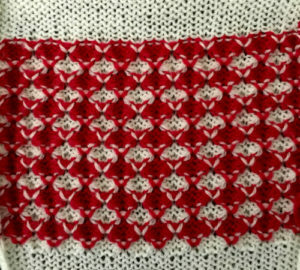 The question has often been asked as to why knit with 2 carriages. 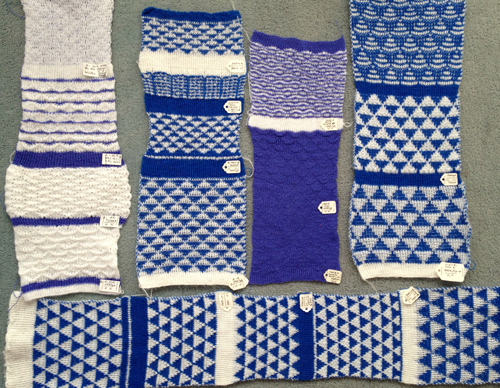 For me, it became a personal favorite for knitting fabrics requiring color changes every even number of rows. 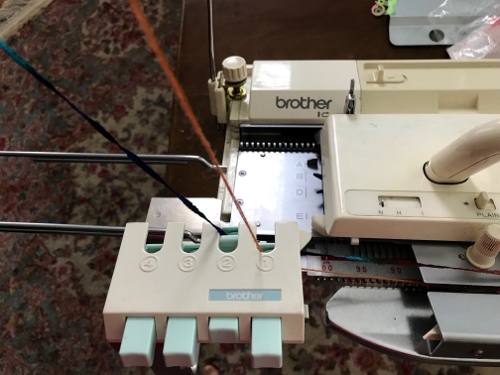 I tend to push the limit with materials, and found the Brother single bed color changer to be quirky. 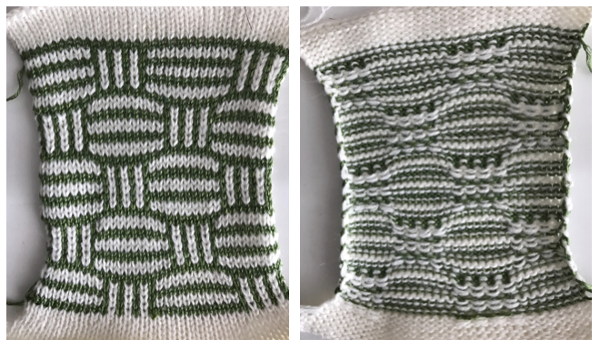 When using 2 KCs there is no pushing the wrong button for the proper color in the sequence, or accidental choosing of an empty slot and dropping the knitting. 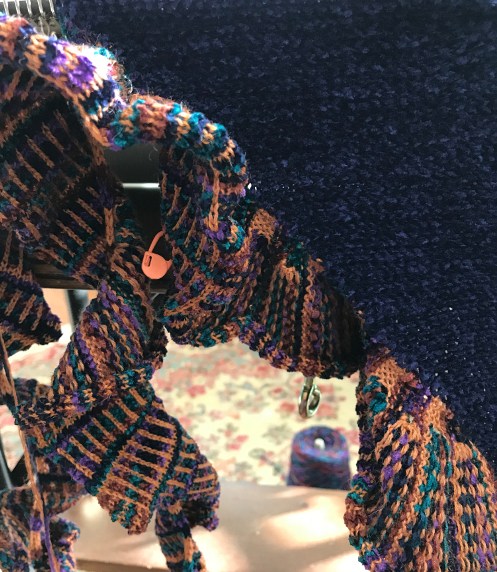 Some of the loops at color changer side edge or yarn getting caught in wheels or hooks is also eliminated. 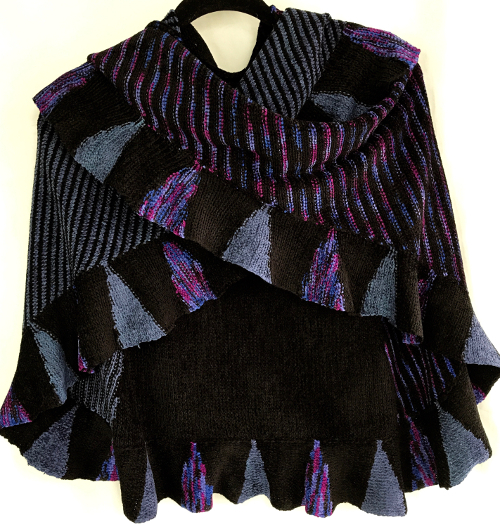 Each carriage can be set for a completely different function from the other with no manual cam button changes ie single color knitting vs FI, its own tension depending on desired effect or fiber (ie striped shadow pleats), etc. 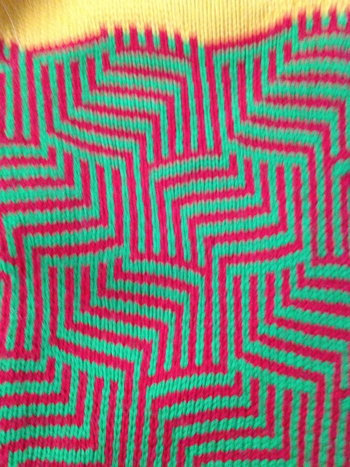 Floats along the vertical edges of the knit as a result of the striping happen on both sides rather than all on the color changer side. The principles apply when using the lace carriage and combining it with tuck, slip or FI settings in the KC. 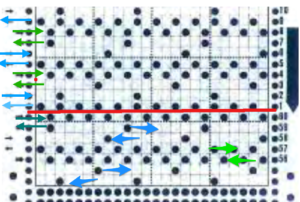 If one is following a published punchcard pattern for such fabrics, frequently there are guidelines as to when to change colors, but no explanation as to why the cards are punched the way they are, so understanding what happens enables one to interpret directions for electronics. 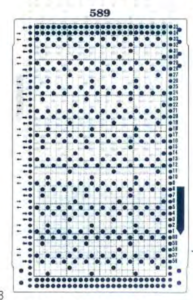 When going from published 2 carriage punchcard machine repeats to electronic, the repeat needs to be adjusted to compensate for the change to row by row selection. 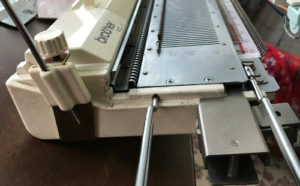 In punchcard machines the needle selection does not advance when you switch to operating the carriages from the opposite sides, so the pattern for those rows knits twice. 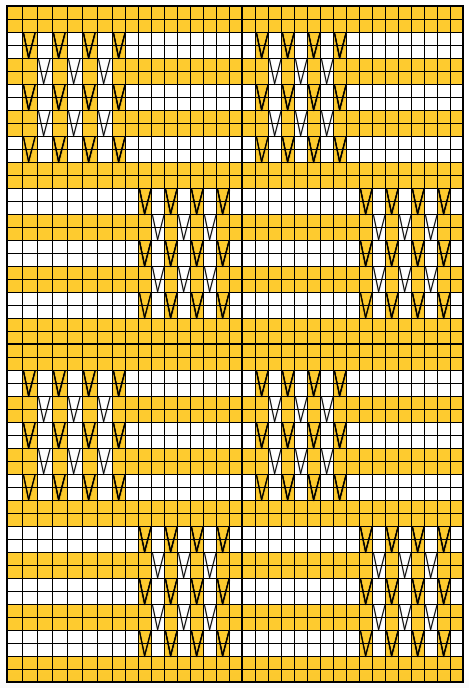 I have added an new category to my side bar to make this topic search easier: Patterning with 2 knit carriages . 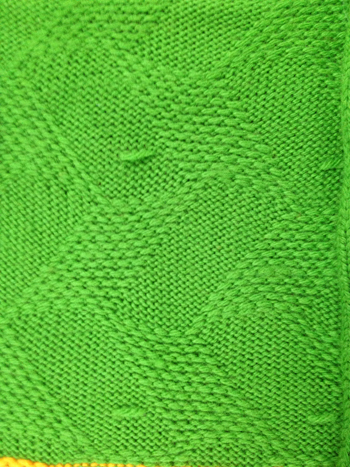 Included are color separations for some fabrics suitable for this method of knitting. 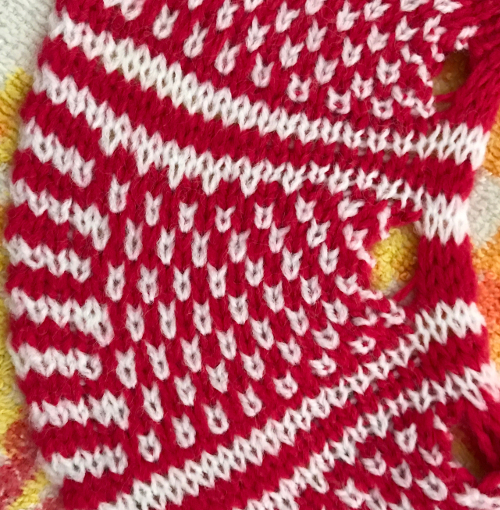 Will not work if the pattern is adjusted so KC knits the first 2 rows and parks on left, with attempted use of LC from right. 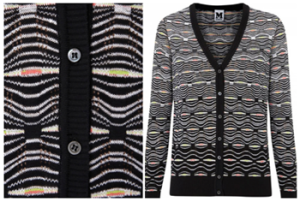 LC will not select. 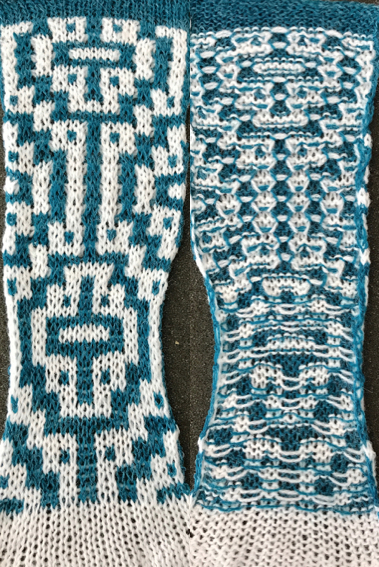 In the past, when I tried to knit with 2 KCs, one on the left an one on the right, both selecting needles, I was unsuccessful, but in light of the above experiments I decided to test the idea with the RKC (the one that would operate from the right) selecting and then knitting the first 2 rows of color, in turn resting on right side. 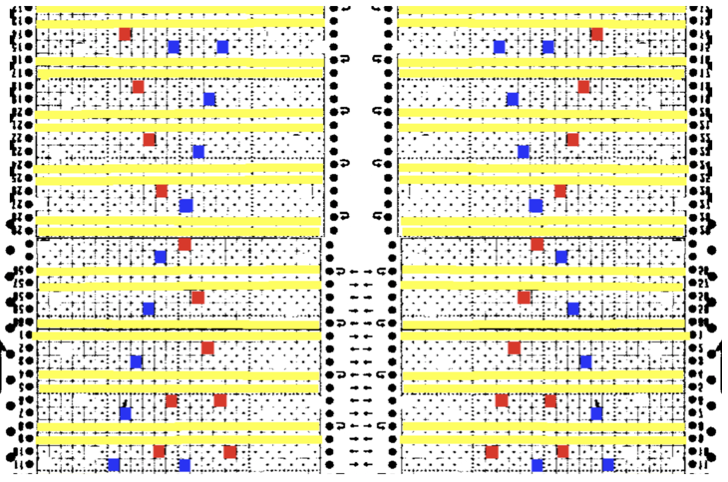 I then operated the second KC from the left, alternating carriages every 2 rows. 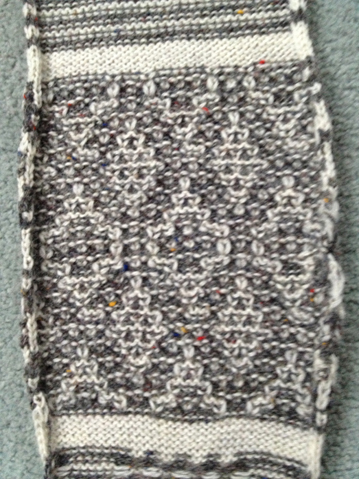 Knitting at a slower speed and moving each carriage perilously far out on the extension rails did the trick. 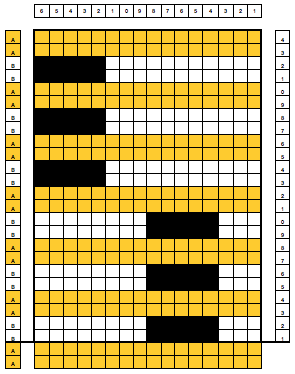 To use the repeat in Ayab, in order to keep the proper color sequence, the last design row is shifted down to row 1 position. 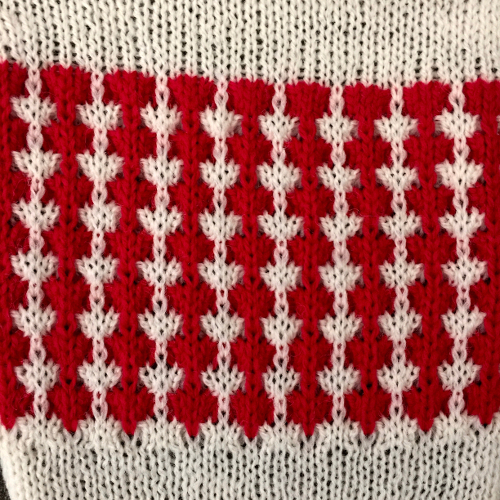 There is an error in the repeat, marked by arrows I did not notice until I had completed the swatch. The repeat may be used as is, and color reversed via action inverse in Ayab, or color reversed prior to loading the image, which I chose to do personally. 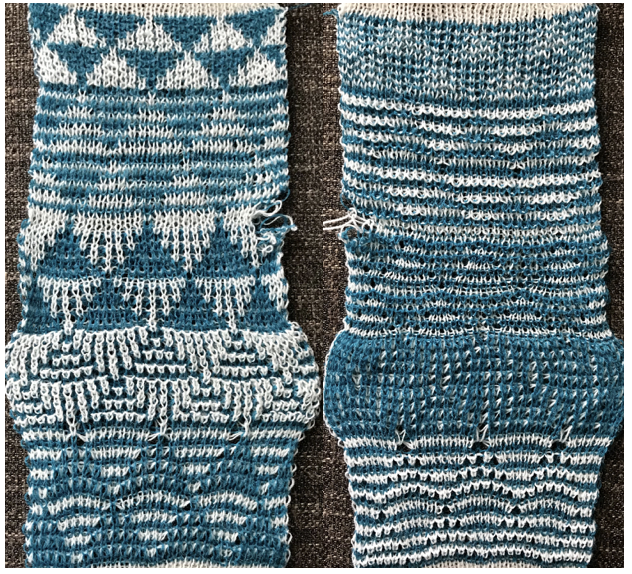 This is grabbed from the ayab screen: the knitting is actually mirrored automatically by the software, so what is shown onscreen is what appears on the knit side of the finished piece. Something to keep in mind in situations where placement and direction might have some importance. 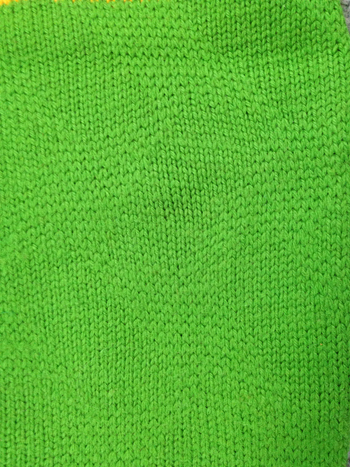 Things to notice in swatch : as already mentioned, there is an error in the repeat in terms of my intention. 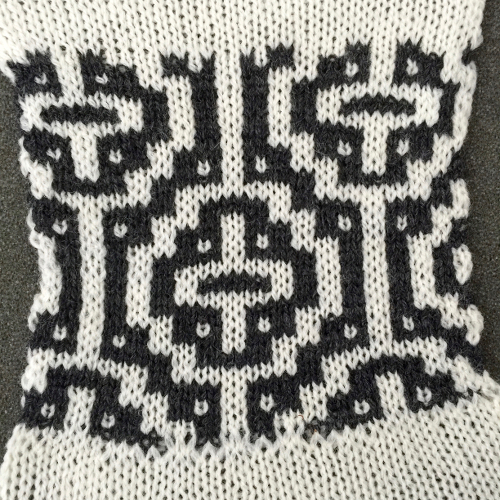 Placement for the slip stitch blocks could certainly be planned for an asymmetrical effect, varied in size, and more. 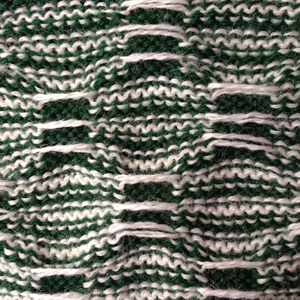 Slip stitch is significantly narrower than stocking stitch. 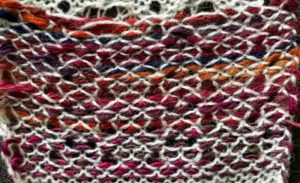 That would need to be allowed for were the stitch to be used in a garment or gauge dependent knit. 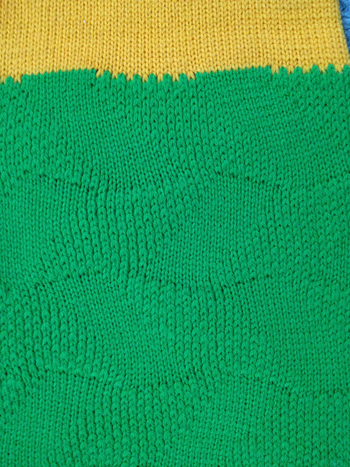 Examining the purl side of the knit, which is facing as one machine knits: the intentionally dropped stitches at the start on both sides are there because I had cast on extra stitches that were outside the parameters of the programmed repeat width. 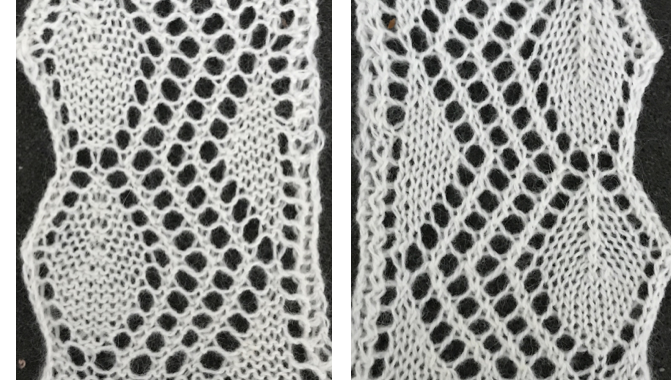 The left side edge, next to LKC (left knit carriage) is visibly shorter than the right. The two yarns used were of different thicknesses but knit at the same tension. 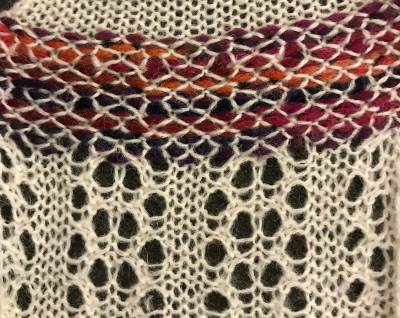 The LKC would have merited from a looser tension, and an edge weight on the very last stitch on that side would help with adjusting the length the white edge “floats” from one color change to the other as stripes are created . 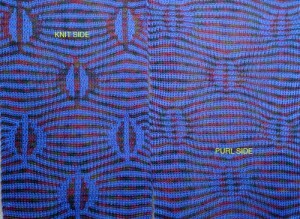 Handling of side floats in striped knitting is dependent on the row height of such stripes. 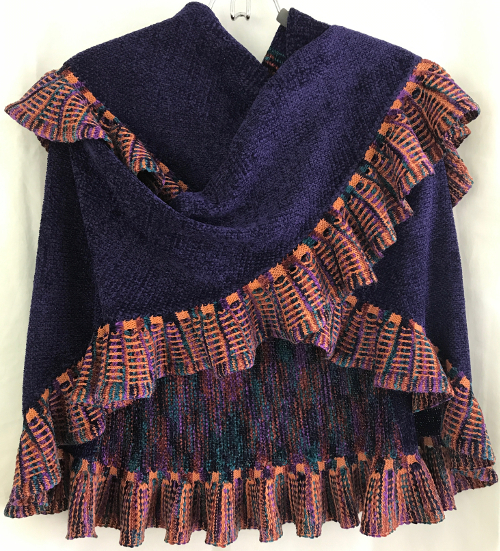 There are a great number of interesting ribber fabrics that can only be knit by manually changing the ribber settings to slip in both directions, so that the main bed only knits for X # of rows, with the ribber carriage periodically set to knit again. 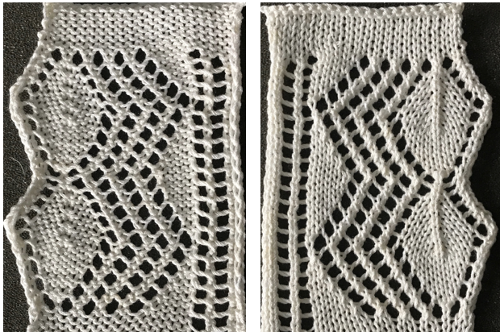 If the function happens for an even number of rows at a time and in both directions, the sinker plate for the KC may be altered for use with the ribber in the up position, to knit the main bed stitches only. 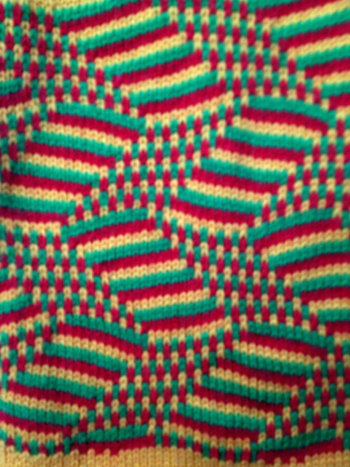 Its change knob should be set to KC I to insure that the first and last stitch are knit. 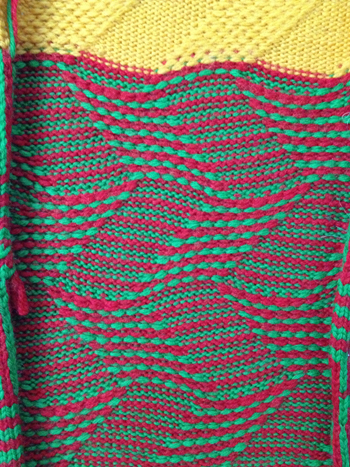 I knit this sample using the altered KC selecting from the right, the KC engaged with the ribber sinker plate selecting from the left. I will address the altering process and steps involved in the knitting in a separate post. 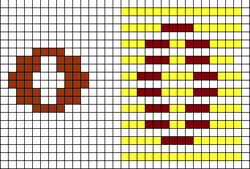 This is actually a reworking of a previous post. I usually sit on any post for a while, returning to it, editing multiple times out of view, and publish when satisfied with occasional return visits. 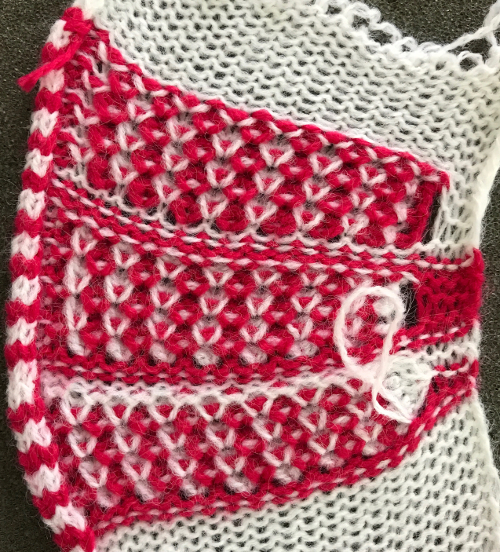 Thanks to comments from another Ravelry member, I realized after my first “quick” publication on 589 that I needed to take another look at my thinking on this particular card from the very start. 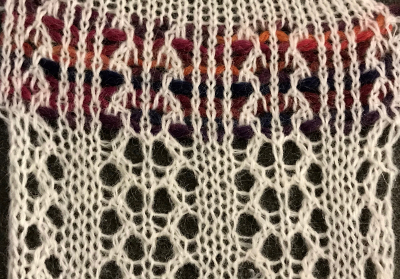 I chose to stay public during editing to show that no matter the level of skill or time spent knitting, sorting out issues for any particular design or fabric can take time, sometimes obstinacy, and that at times the simplest route is taking good notes during the actual process for the most direct results in terms of clarity. 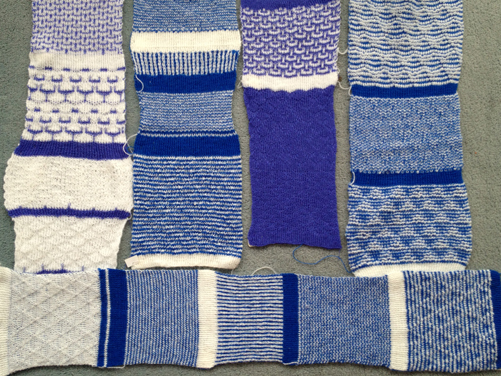 I have been knitting a long time. 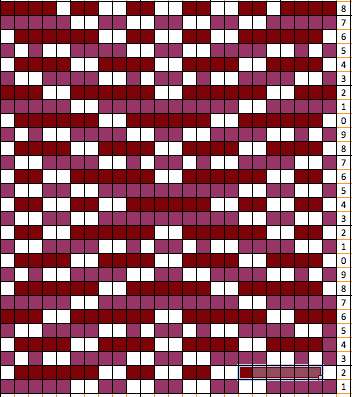 Sometimes things seem so obvious to me as I work, that I do not take notes. 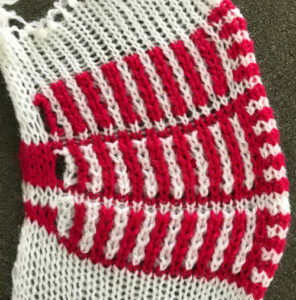 I still have a swatch from my teaching days that fell into that category, and that I have never been able to duplicate. 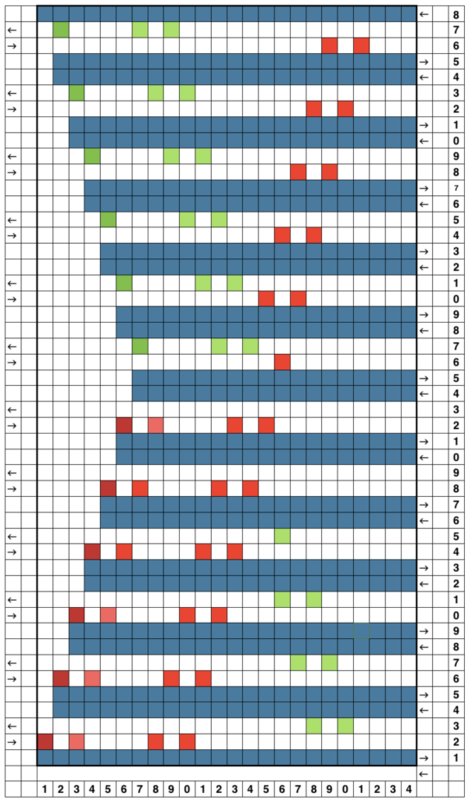 With the 910 and the limited availability of space on mylars, I sometimes erase too quickly, and now that my charts are being created in a new and not yet habitual and familiar to me programs (Numbers, in high Sierra and Pages) wonderful, “surprise” variables can happen. So tips to self: keep step by step notes to return to as a reference, choose order of steps top down or bottom up and stick to one or the other, try not to scrawl randomly and everywhere on any one sheet of paper (never mind keeping it legible), don’t recycle papers with such notes when you think you are done, and watch those autosaves and revert options in Numbers and Pages. 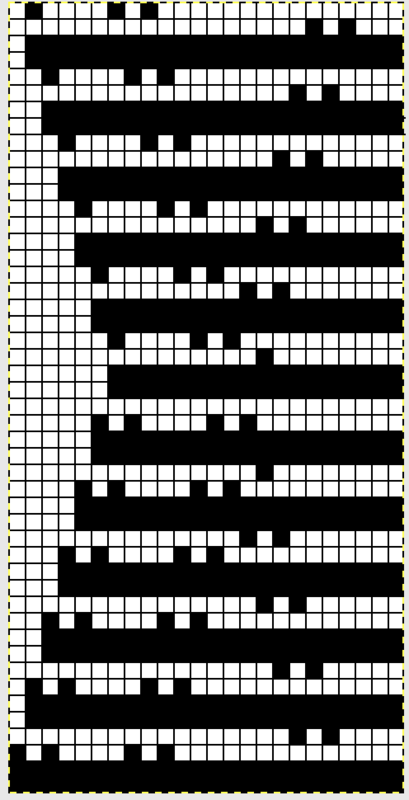 Then there’re the added factors of occasional WordPress crashes during saves, taking what one assumes as familiar for granted, and of simply putting even single, lone black square in the wrong place on a mylar sheet. 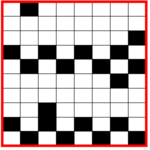 I found with this series merely editing information in the software was not enough. 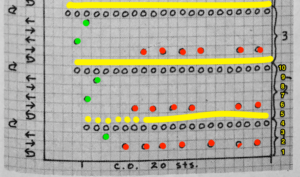 Some of the errors became easier to see when matching the software theory to actually taking notes the old fashioned way with each carriage pass on the 910. 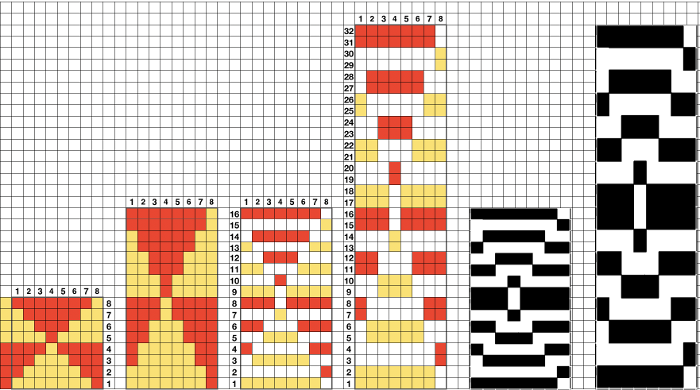 Analyzing the card, sorting out possible repeats follows, since mylars or bitmaps for download often only require a single repeat of the pattern. 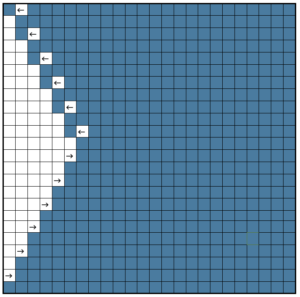 If you are not used to doing this, sometimes beginning with recognizable vertical ones first is a bit easier. 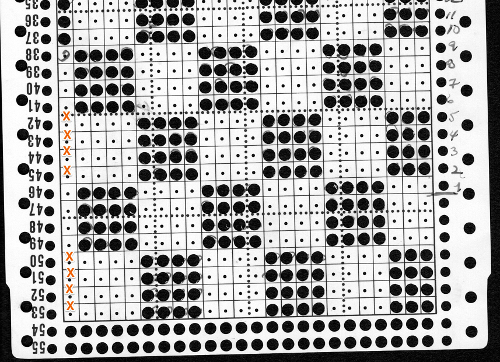 Going from lots of dots to far fewer ones can be dizzying. 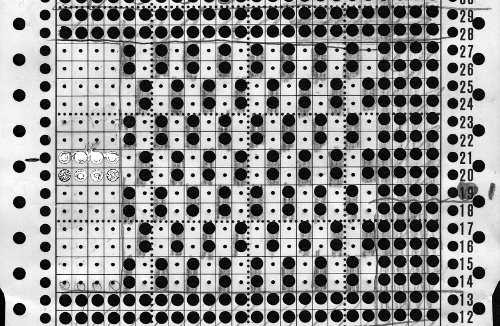 The punchcard multiple vertical repeat on the left is double checked to insure that all marks are in the correct placement on my chart. 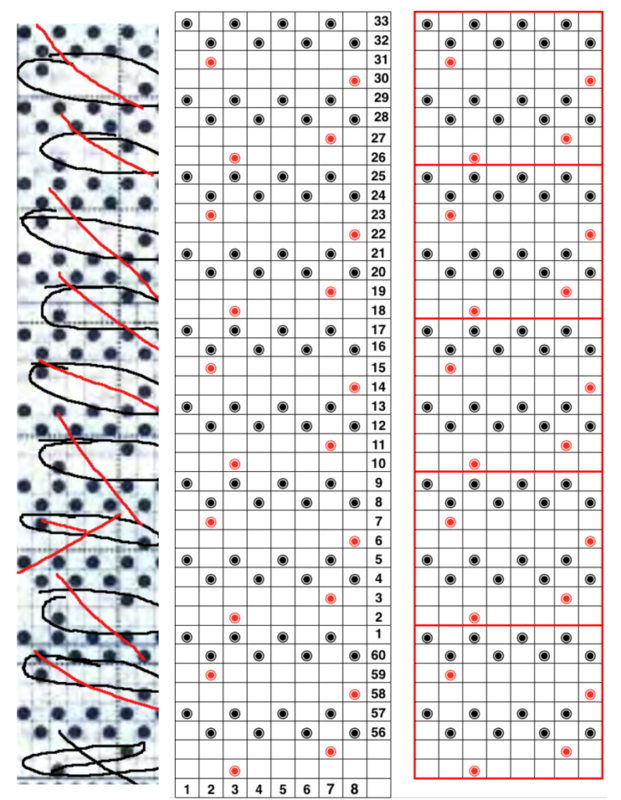 Black dots for EON needle selection, red ones for lace transfers. 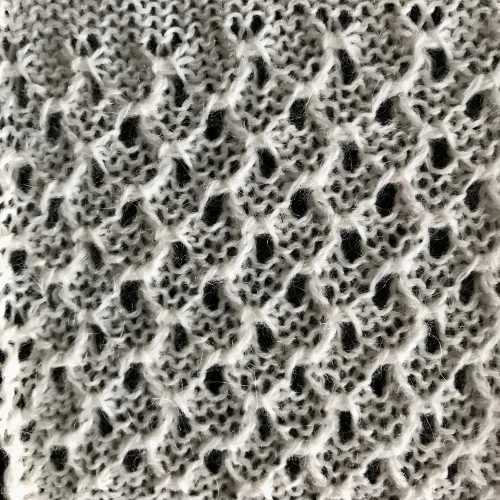 Here things get checked off twice, particularly for lace holes. 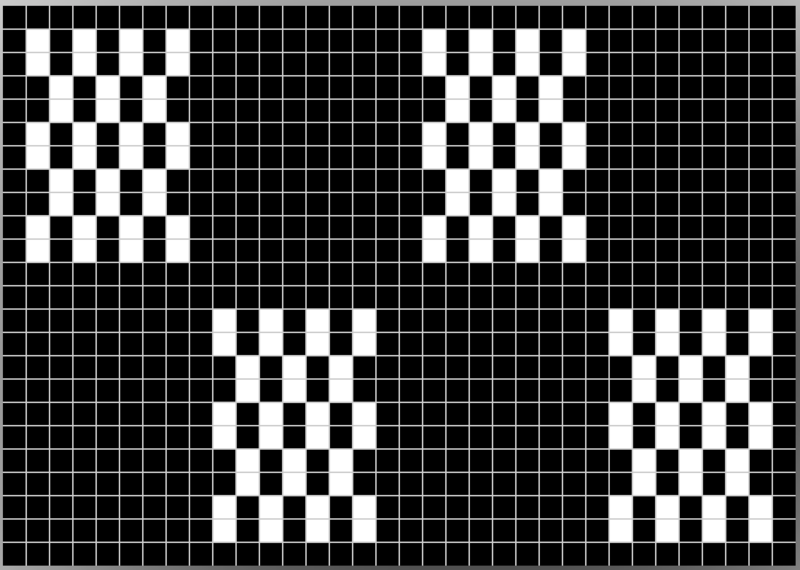 Lace cards are the hardest to copy and place pixels or black squares accurately, simply because their markings are so few. 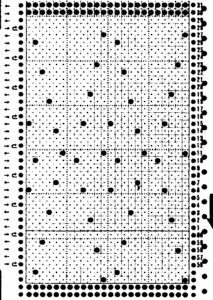 I usually begin on the left hand side of punchcards to isolate my repeats. 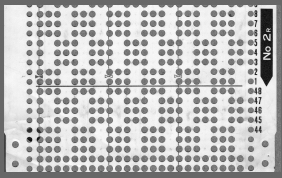 The number markings in the center image reflect those found on the far right of Brother punchcards. 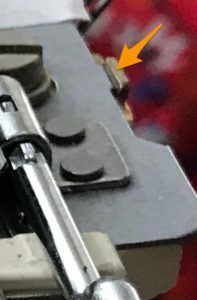 The #1 on the factory cards represents where the card reader teeth are reading the holes on the interior of the machine, not at the operator’s eye level on the machine’s exterior. 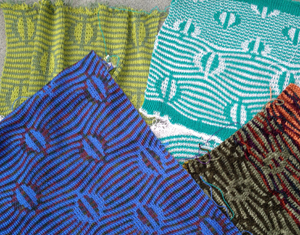 That is also the reason why in any fabric, needle selection does not match expected design row. 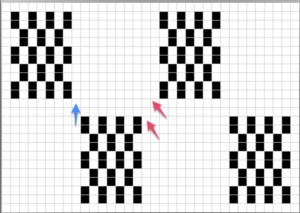 On the far right, a single repeat in height is isolated further. 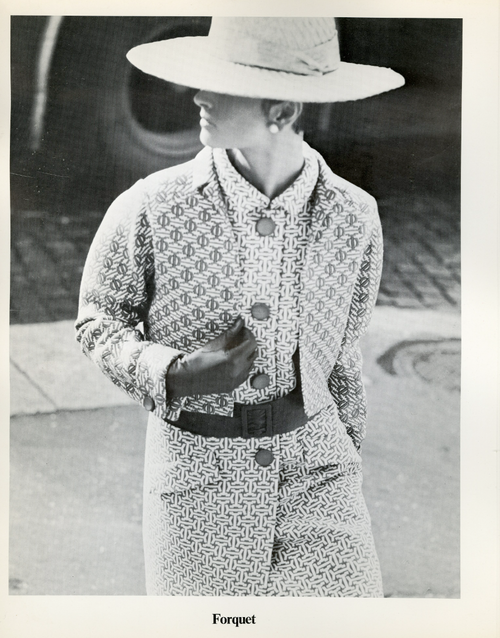 The same sort of check should be done when punching cards from published images. 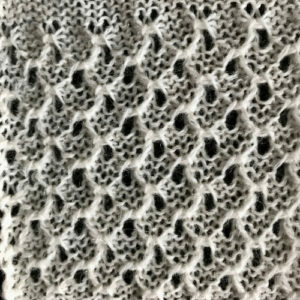 Blowing up the source and printing can help with accuracy. 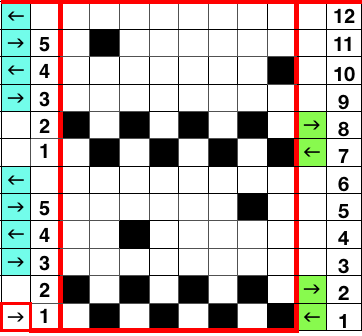 Operating carriages for even number row sequences is is the most convenient. 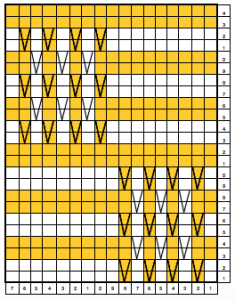 The assumption on the basis of the arrows in card 589 is that each carriage makes 2 passes, operating in a continuous loop. 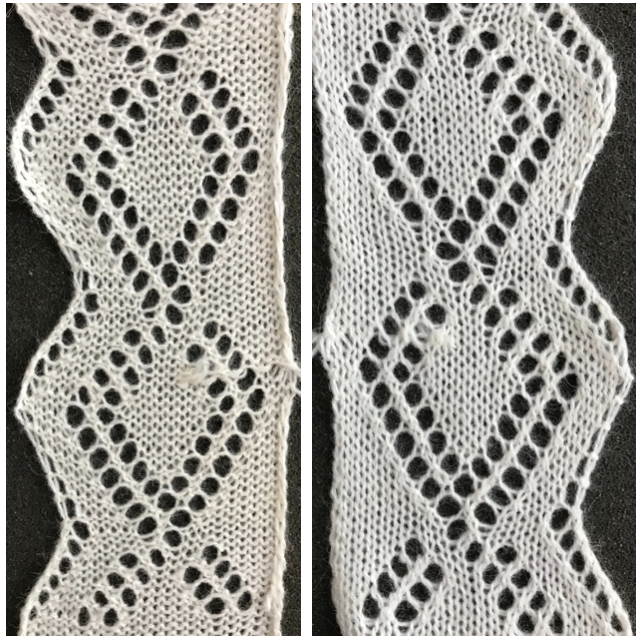 That simply did not work for me in terms of producing 2 rows of lace followed by 2 more in any other pattern when operating LC from left, and KC from right. 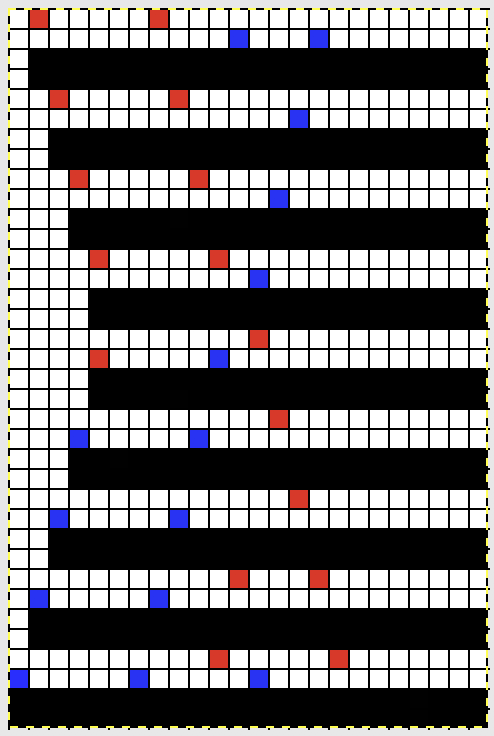 If punching a card, verify your final punching by holding black paper behind the punched holes. 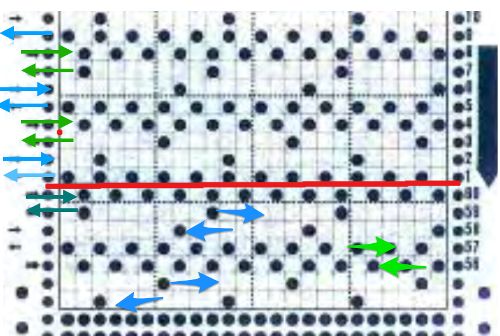 In this instance there is an obvious mistake on the third row of holes. 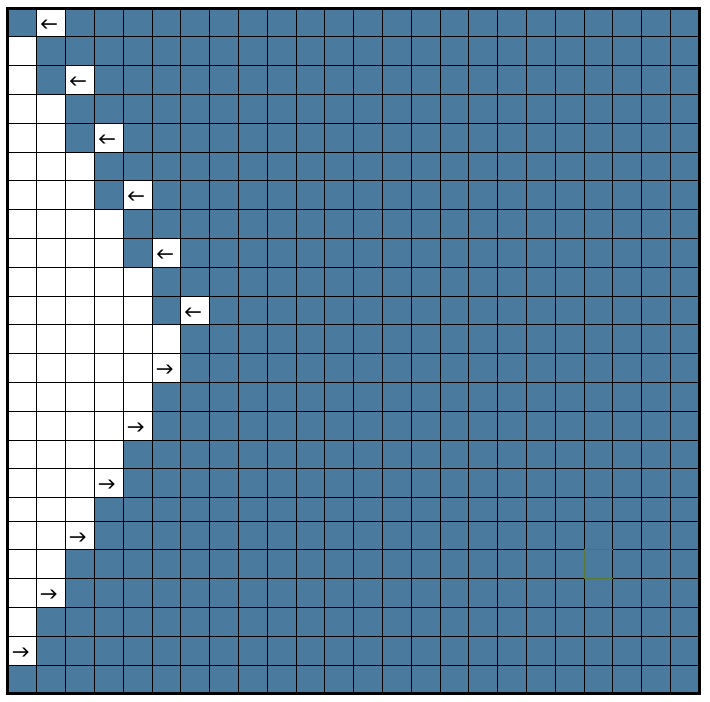 I am at the end of a very long punchcard roll. 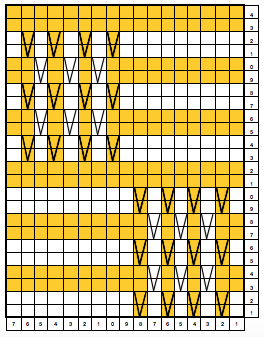 Some of the new rolls are wonderfully sturdy material, but the roll can retain a curl that may make it easy for the card to roll back into the reader unless joined into a tube (resulting in patterning errors), and making it hard to feed its starting rows into “punching machines”. 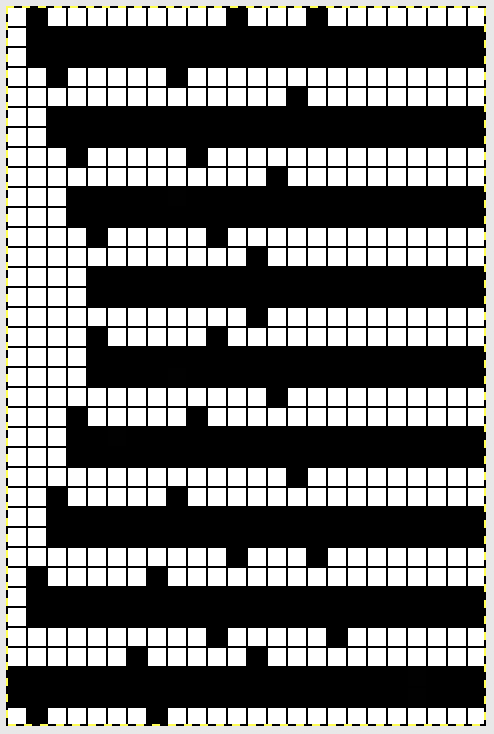 The rolls are marketed for Brother use, and numbered separated into “standard” lengths with blank segments between them. 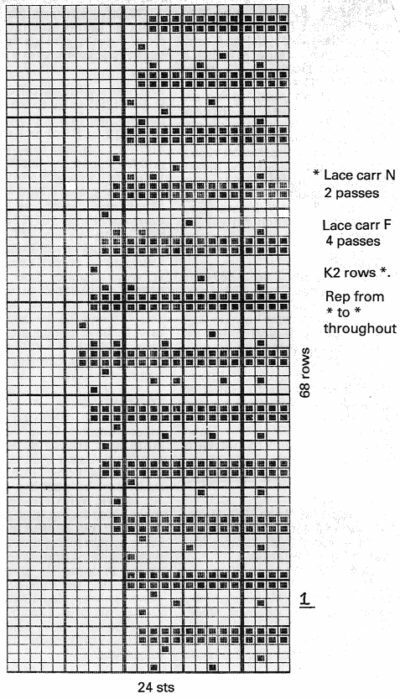 Those markings may however, be for Studio machines use (seen here, at row 5), with row one on the right actually being 2 rows too low for Brother, so as punched LC first preselection row would need to happen on row 3. 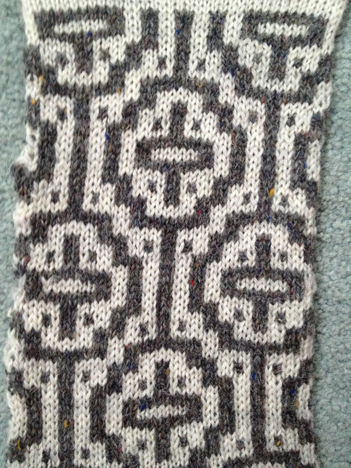 589 begins with lace transfers. 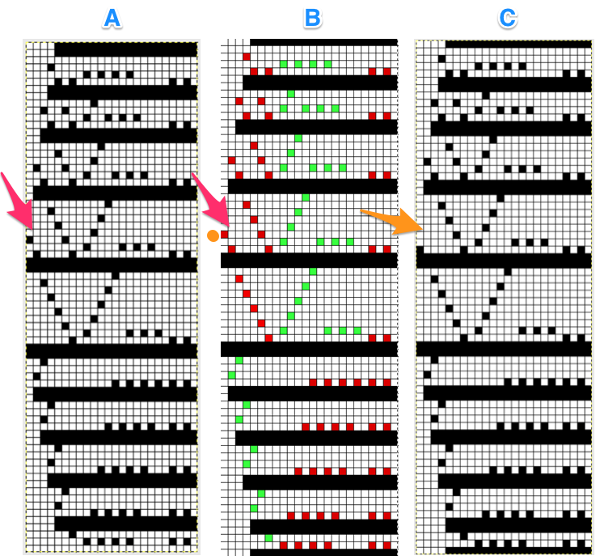 A second option, is to begin with a weaving pattern, with the KC on the left for the first selection row, and beginning your pattern reading 2 more rows up from the lace starting line in the punchcard. 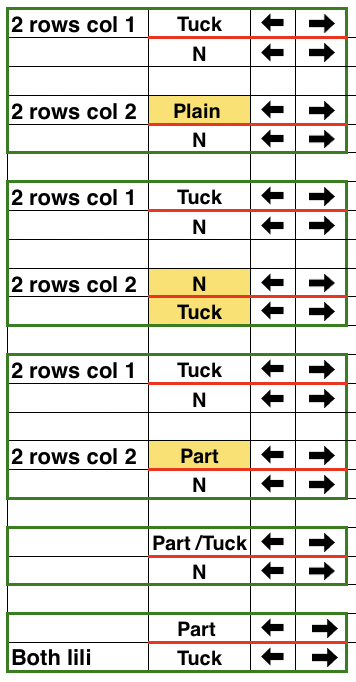 Markings on the side of the image above have nothing to do with actual starting rows. 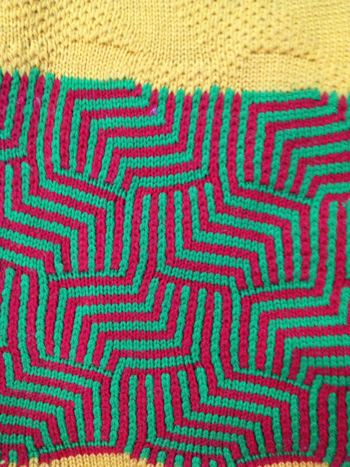 Pencil lines are outlining individual repeats, have no other reference. 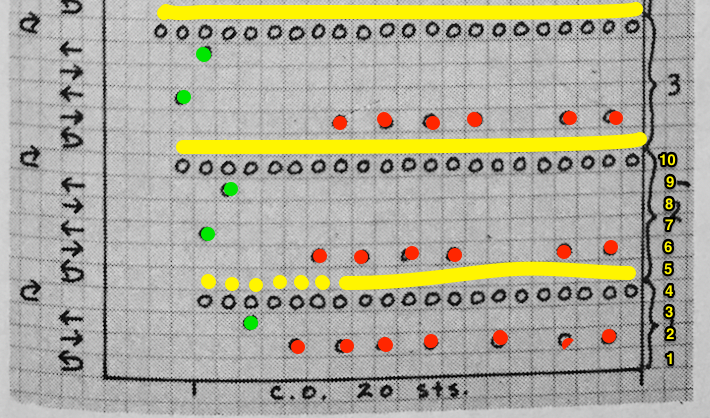 Numbers and other necessary marks would require adding by hand. 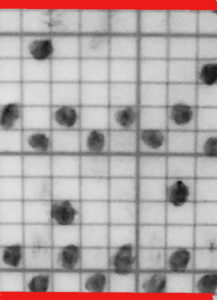 If hesitant, #1 marking on right may be double checked by overlaying a factory pre punched card over your own. 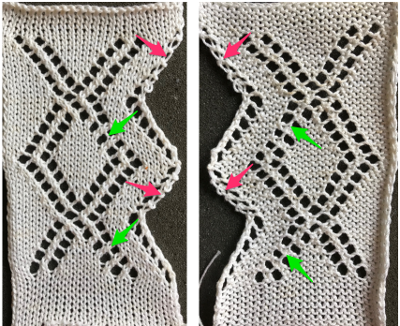 The end needle selection needs to be cancelled on lace rows to avoid transfers or dropped stitches on the edges of the piece. 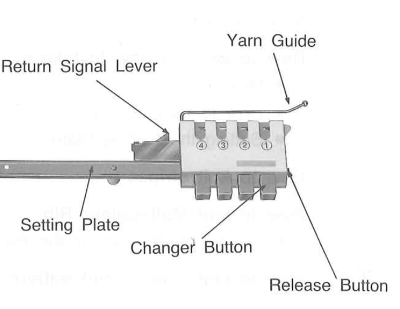 If a needle is selected, manually push it back to B. 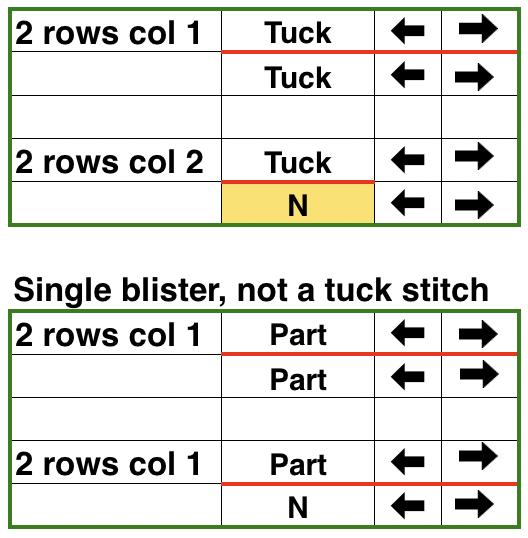 If patterning ie tuck, slip, or FI are used on alternate groups of rows, then end needle selection is preferred. 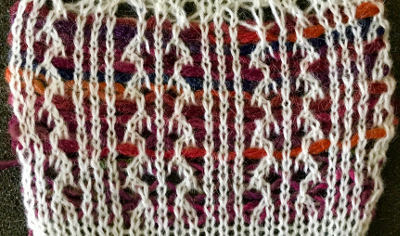 In weaving, 2 side by side stitches drop a float, so keeping the EON selection on both sides gives a better edge. 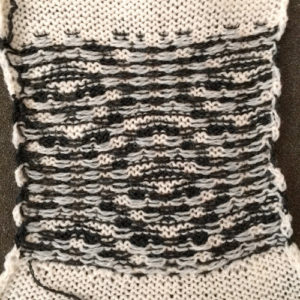 Invariably, some operator involvement is needed altering end needle position, no matter the setting for it on either carriage. 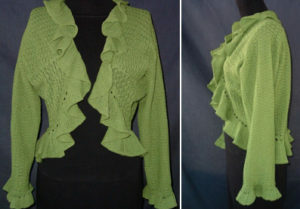 Even with a lot of knitting and design experience results are not immediate. 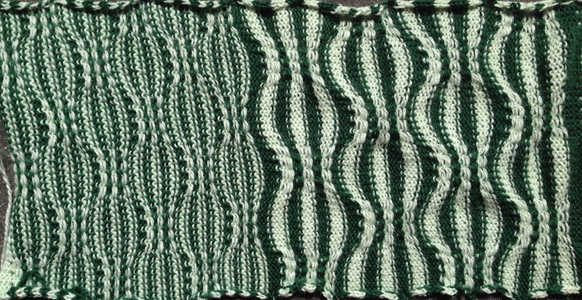 I ran into issues when I first tried to knit on the 910 with a later, “final” repeat selection being correct, but the technique failing, resulting in a loopy mess. 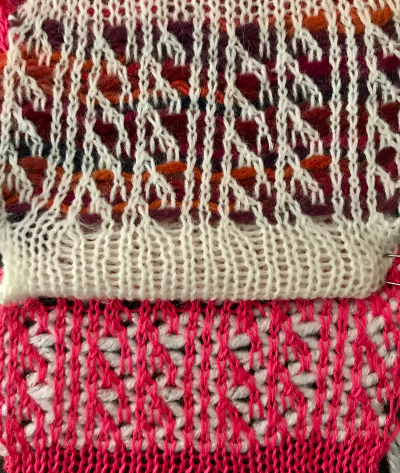 In weaving, weaving brushes need to be moving freely, so check them, unscrew them, remove any fluff, and air knit, making certain they are down and turning at the same rate in both directions. 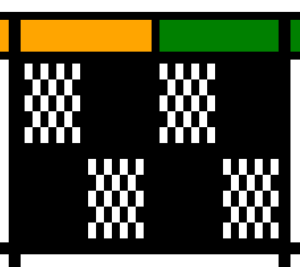 Tuck wheels if movable, should be in the forward position, lined up with all other wheels or brushes on your sinker plate. 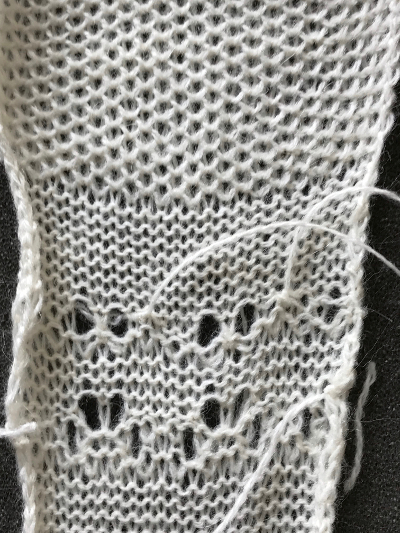 To isolate the problems further: test lace with your knit carriage selecting, but no cam buttons pushed in. 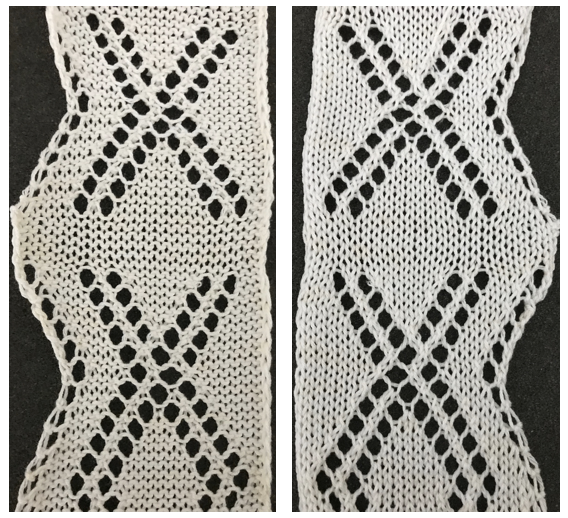 The KC will knit for 2 rows across LC transfers, creating only the lace pattern involved. 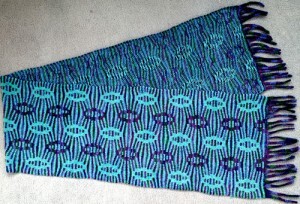 Your mylar markings get checked, also offering an opportunity to sort out why stitches may drop, and if you indeed have patience to combine techniques for more than a few rows. 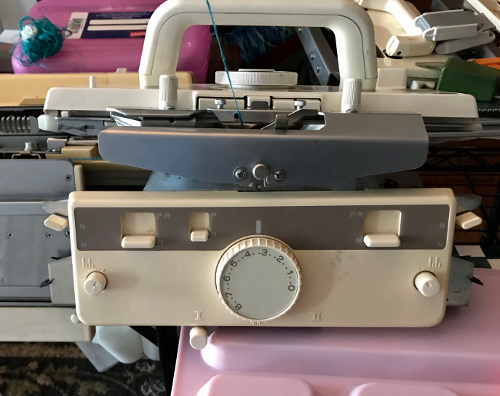 It is easy enough with an EON needle pusher to test both weaving yarn and needed ground yarn tension. 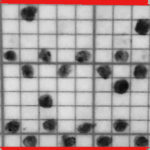 If that is successful as well, then issues occurring with patterning may be from other causes. 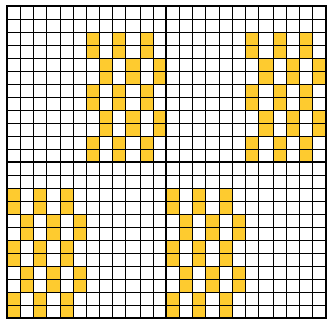 They were in my case. 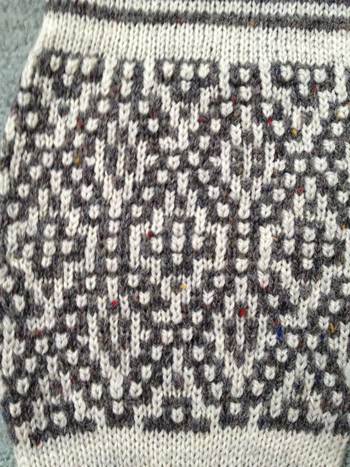 I had to switch sinker plates in my knit carriage to get weaving to work properly. 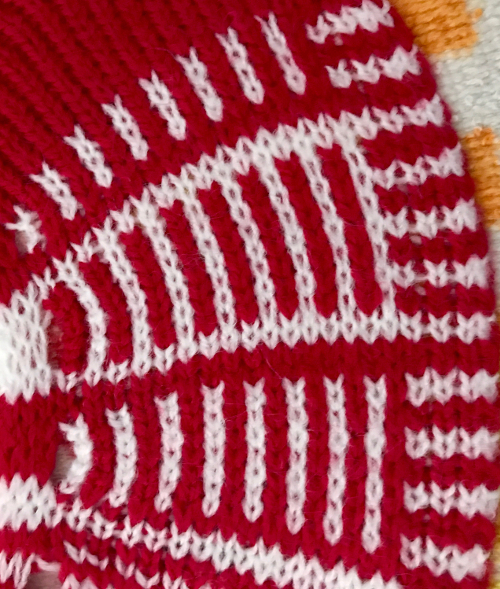 I failed, however, at combining the final repeat with tucking, even with the KC set to tuck immediately after the transfers, and to knit every needle in the opposite direction. 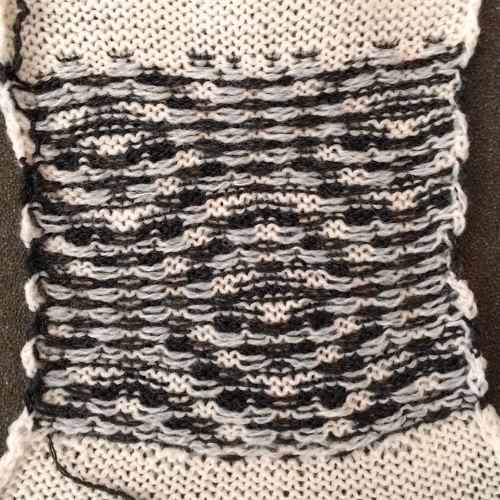 I tested the carriage, sinker plate, and patterning with EON tuck only with different designs, and had no problem. 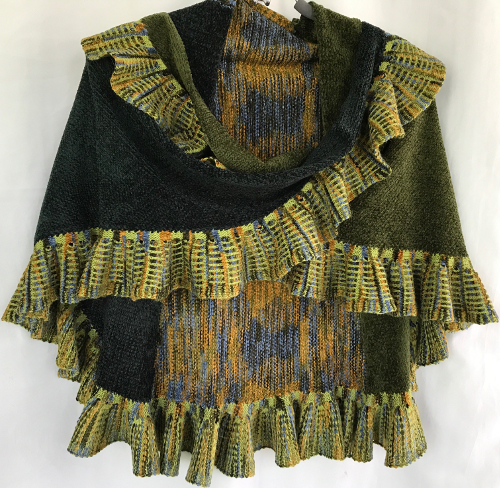 At such a point I would abandon that fabric combination with the particular mylar repeat. 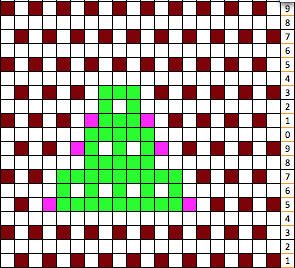 This is the result I was still trying to get back to. 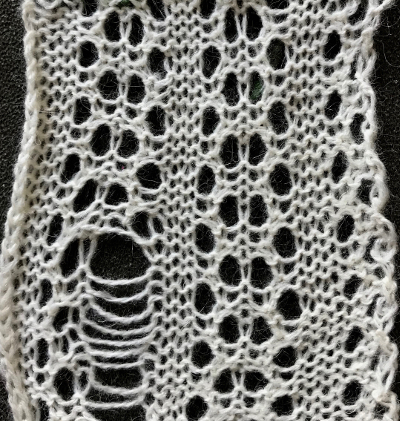 The first lace pattern test swatch: gotta love dropped stitches in lace! 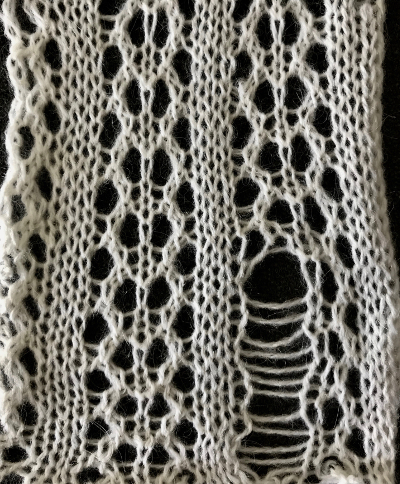 no tucking allowed in combo with lace, but not a carriage or mylar problem weaving test: fails were from a problem sinker plate weaving lever in one direction only, hand technique success was with change of sinker plate lace and weave with 2 different weight yarns and, hallelujah! 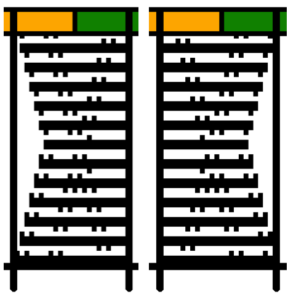 If 2 carriages are in use for patterning extension rails are a must. For this discussion we are excluding the lace carriage as the #2, the intent is to use 2 knit carriages with each set to desired cam functions. As one carriage is put to rest and the other one is set to move from the opposite side, the card does not advance, so the last row selected is repeated one more time. 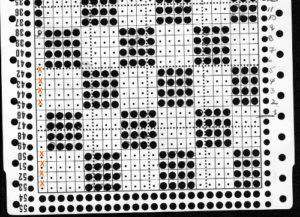 In one of those lightbulb moments today (any excuse not to do laundry) it occurred to me that starting out with an odd number repeat pre punched card, coming from the opposite direction at the end of each odd row repeat, an even numbered repeat would actually be knit. The card below is Brother issue with all standard knitting machines. 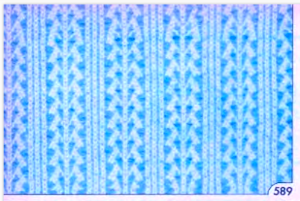 Card number (2 in this instance) may vary, depending on year of purchase. 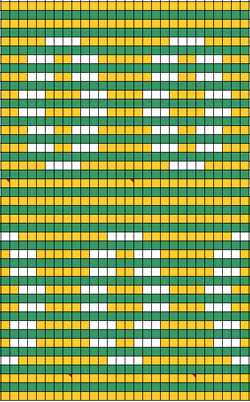 Color changes here as well would have to be planned for an every even number of rows, so respective carriages can travel to and from each side. 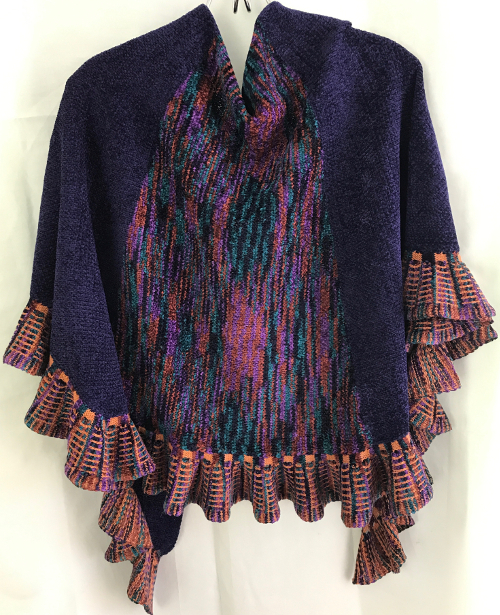 Using 2 carriages allows for combining yarns using different tensions, cam settings, fiber content, or sometimes using materials that the single bed color changer is not “friendly” with. 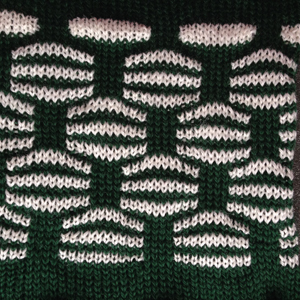 Also, there is no pushing the wrong button, causing errors in sequence, or dropped knitting if no yarn is picked up. 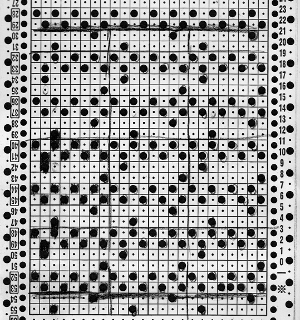 A punchcard carriage may be used on electronic machines. 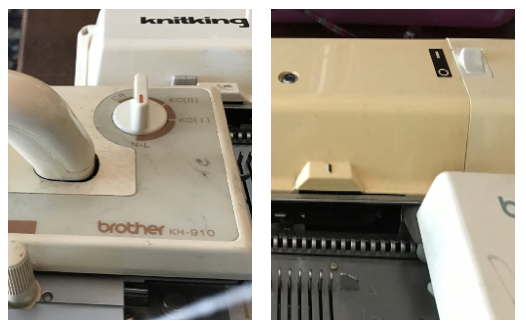 I work on a KH892, and a 910. The 910 is from a much earlier model year than the punchcard machine. 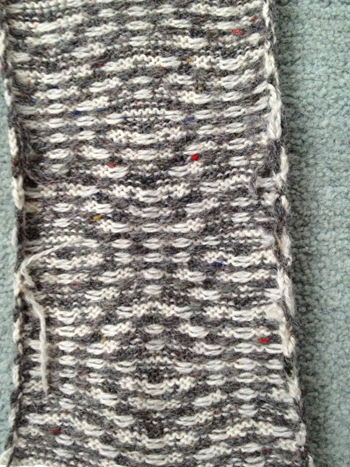 The back rail for the KH to travel on, is a different shape, with slits as opposed to smooth, and a bit more raised. The electronic carriage set on KC locks on the belt, and advances the card appropriately, but the fit is quite snug, making it hard to push, while the 892 behaved well on the 910. 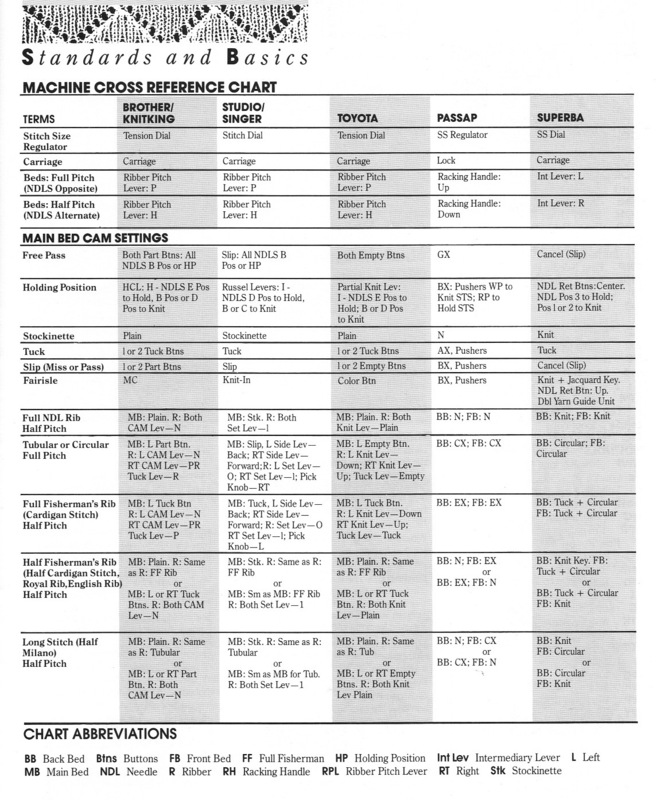 If borrowing carriages and sinker plates from different model years or type of machine to use on another, proceed with caution and listen to your machine. 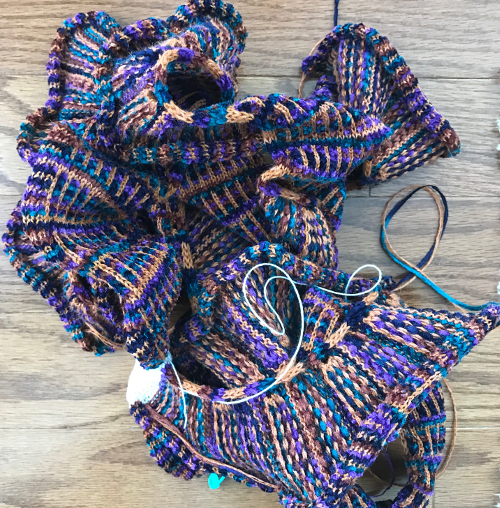 Sometimes the span of time between model issues is irrelevant, even if model years are only a year apart, and the swap is not the best for successful knitting, may “work” in one direction, but not as well in the other. 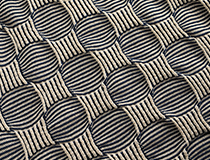 Slip stitch fabrics are capable of creating interesting textures. When blocks of stitches are slipped, the floats that may appear on the purl side are considered problematic by some knitters. 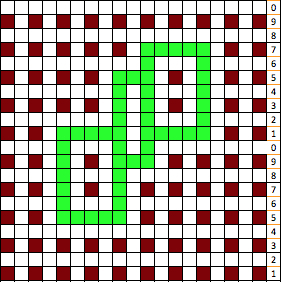 One solution is to work using mosaic and maze “floatless FI” designs. 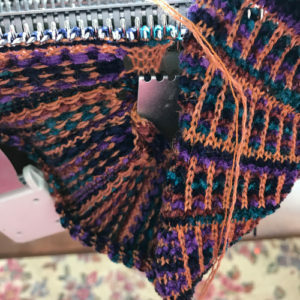 This was addressed in previous posts, including color separation methods for planning them, and a variety of knit swatches. 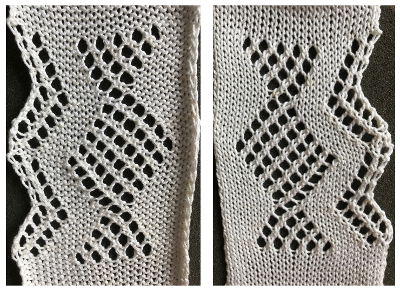 The images below have often appeared in knitting boards on Pinterest, I am returning to the slipstitch design thread. 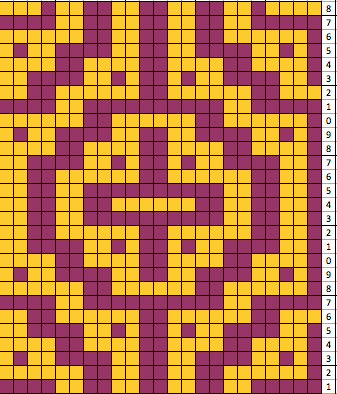 I decided to plan a “square” shape to sort out the technique; it could easily adapted to a diamond one. 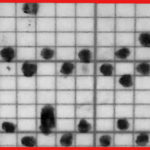 By necessity, larger repeats need to be executed on an electronic machine whether via mylar or download program. 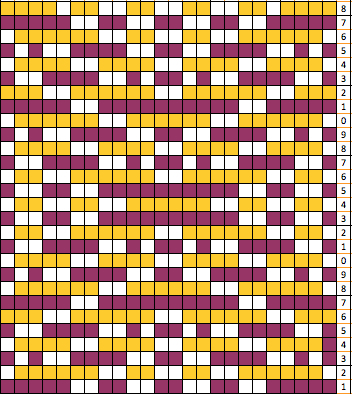 The plan is to change colors by any means available, usually every 2 or every 4 rows, requiring a motif repeat that totals an even number of rows. 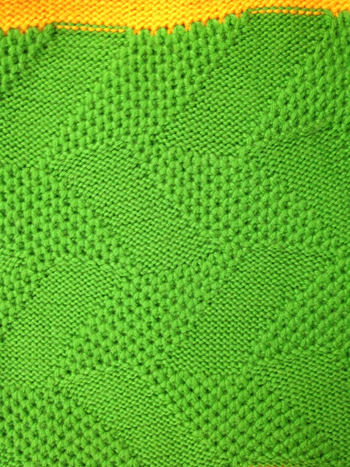 In hand knitting garter stitches can become part of the resulting texture, but they are impractical here. 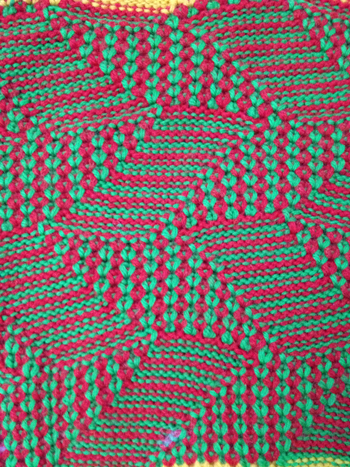 Often commercial knits are produced on machines that can automate many more functions and textures per row. The Missoni sweater is a fine knit, and on a detailed examination, reveals lace eyelets in the some of the stripes in addition to plain knit and slipped stitches. 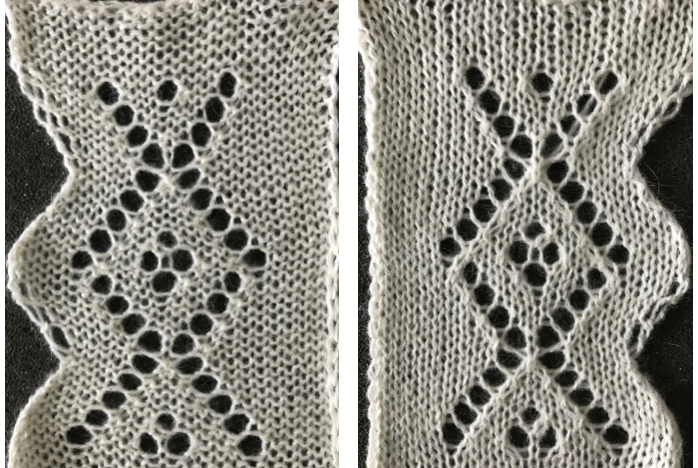 Not impossible to do on a standard KM “home” electronic, but simplest way to add lace eyelets would be via hand transfers. 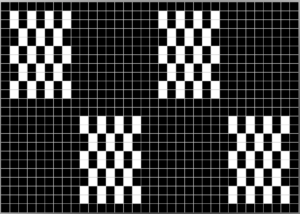 I drew the top repeat above onto mylar for use on a 910. 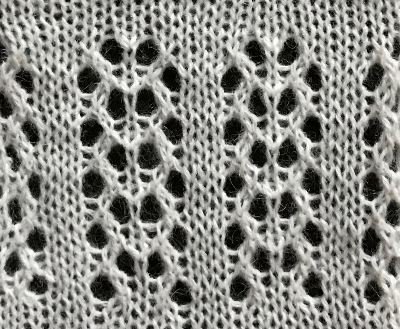 The sample swatch was knit using 2 carriages (and lace extension rails). I selected R 1 from right to left, with the carriage that was to remain on that side, and began knitting with the second carriage, placed on the right, holding the alternate color. 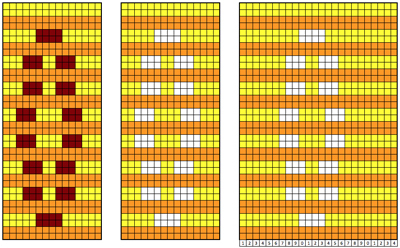 There are a few ways to achieve the pre selection row, depending on the choice of start to the fabric, and whether a color changer as opposed to a second carriage is in use. 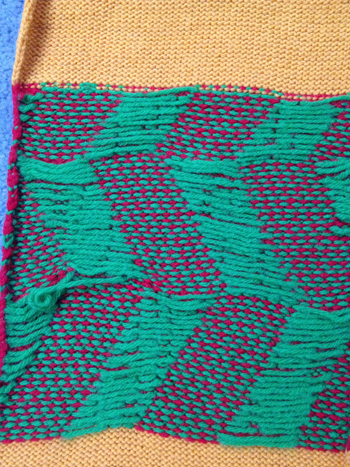 Contrasting colors help see and understand stitch formation. For the bottom of the swatch I used double length as well as color reverse, with color (carriage) changes every 4 rows. 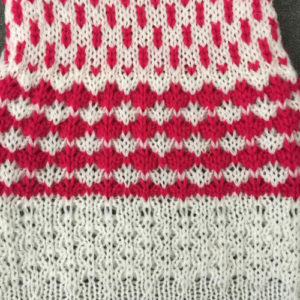 The top of the swatch is knit with color changes every 2 rows. 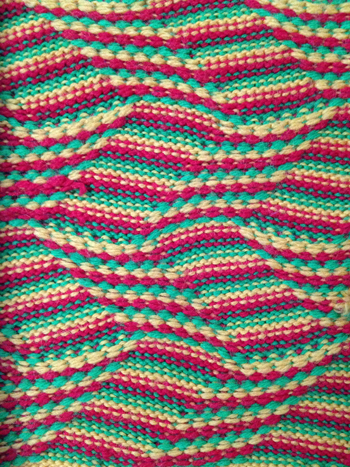 Slip stitch is short and thin. 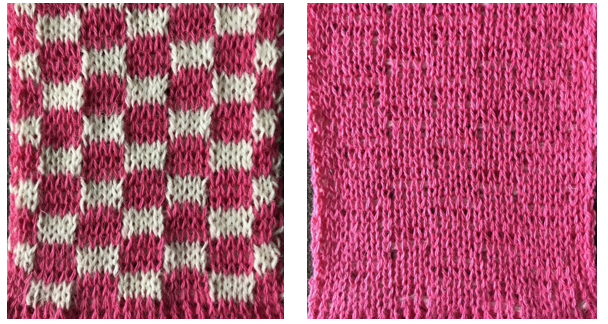 Since there are more stitches slipped on the bottom of the swatch, the fabric is pulled in in those areas, making the knit on either side “bubble” in a way that the top of the swatch, does not, and resulting shapes no longer appear as straight lines horizontally. 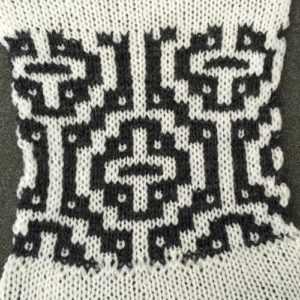 The single width blocks that form the stitch pattern are usable for tuck knitting as well. 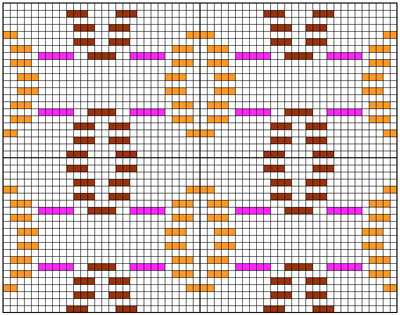 Whether the motif may be elongated on standard machines depends on yarn thickness used. 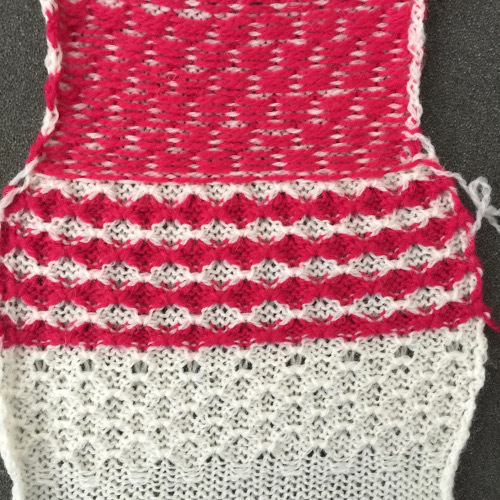 Tuck stitch fabric tends to be short and fat, so the finished knit piece will be wider than the slip stitch version. 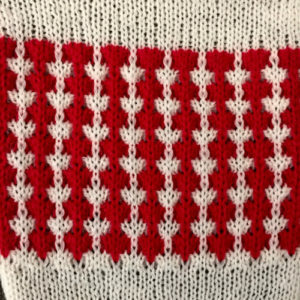 All the white squares would need to be punched to form knit stitches, the yellow left unpunched, to form the slipped ones, the look of the fabric would be very different. 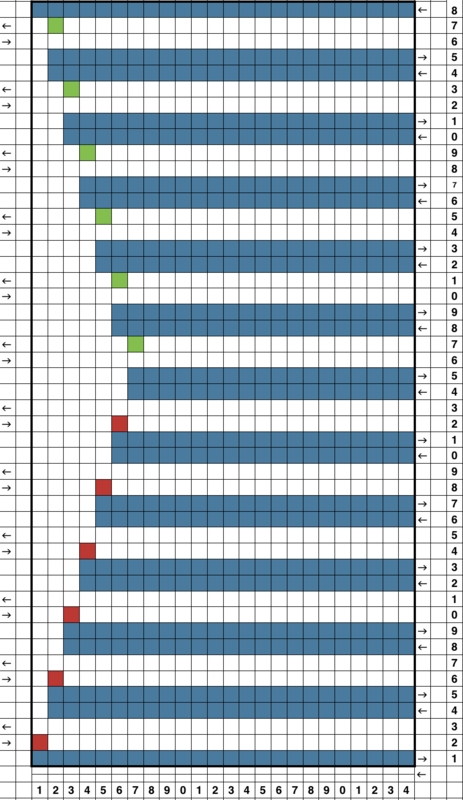 “Pinning” has become part of my daily routine. 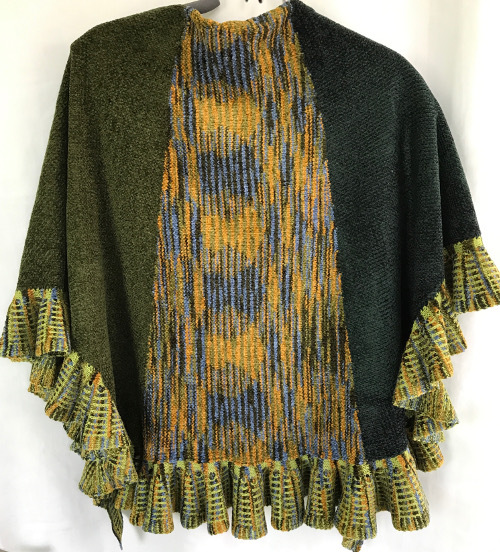 This image was pinned by someone else, and brought back memories of my block stitch scarves, along with the temptation for working out a new repeat, similar to that seen in the top of this jacket credited to Forquet. 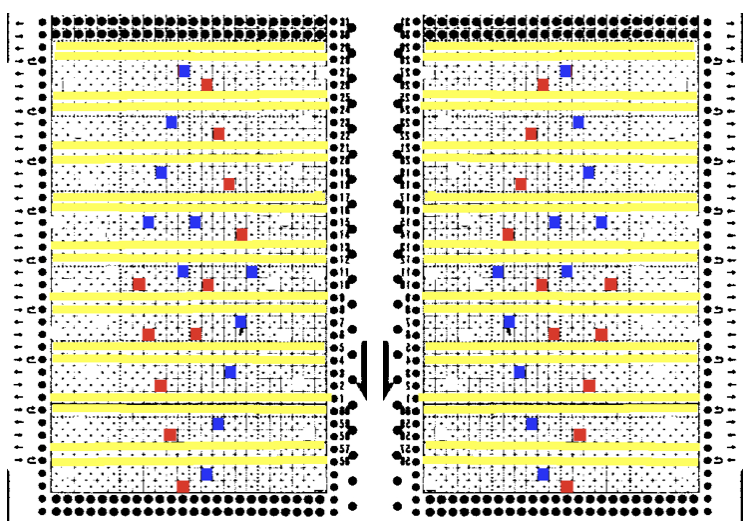 Following are some ideas for developing designs for these fabrics, the basic principles work for both punchcard and electronics. 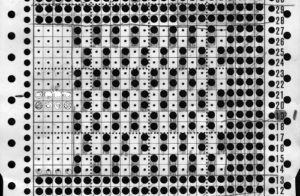 Using the motif in a punchcard will make the striping surrounding it fixed, and involves a lot of punching holes. 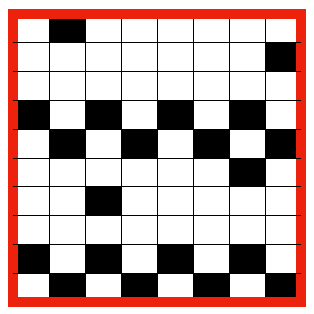 On a mylar or in a download the width of the ground behind the shape can be easily changed, and only the non selecting, “empty ” squares need be drawn or entered into a program that is capable of color reverse. 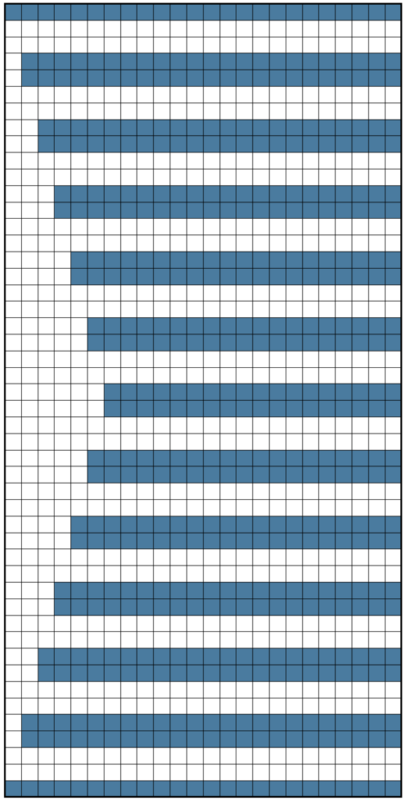 One needs to be mindful of the size in of the overall repeat when faced with so much “blank space”. 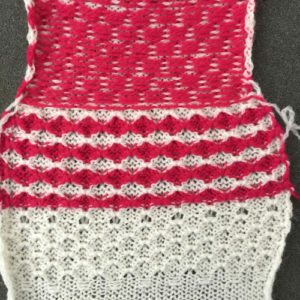 Until one sorts out what happens with the stitches, where the colors are placed during knitting, it is a good idea to start with a simple shape. 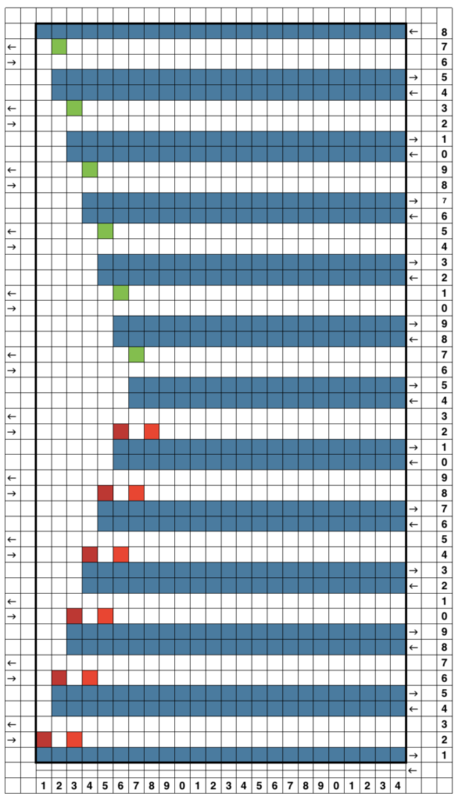 I use excel as my “graph” paper when I want to easily play with color on a grid. 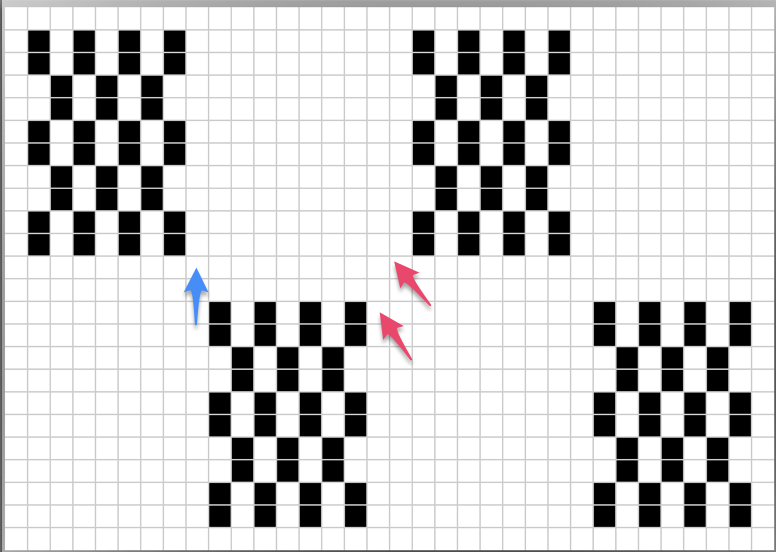 Below is a simple motif as a design start, beside it an expanded graph leaving every other row blank. 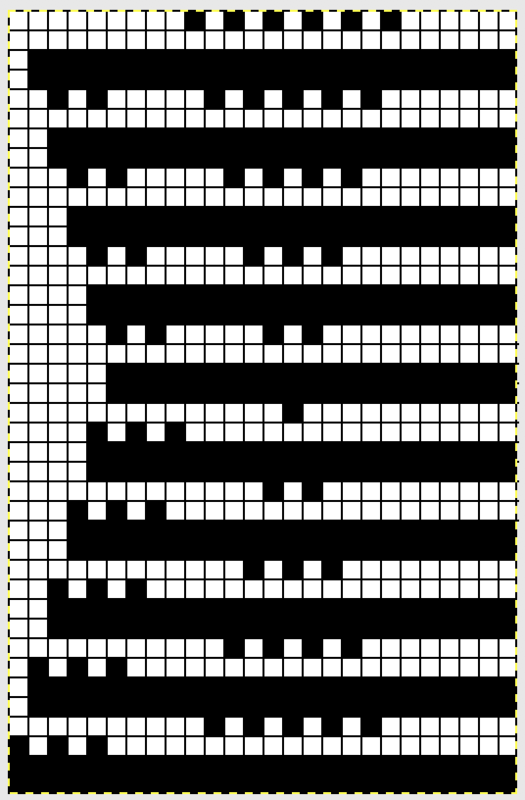 Some books suggest erasing on horizontal EOR stripes, I prefer the visual cues in the method below. 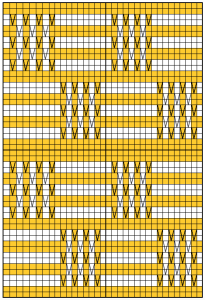 The yellow marks the rows on which the motif will be created. 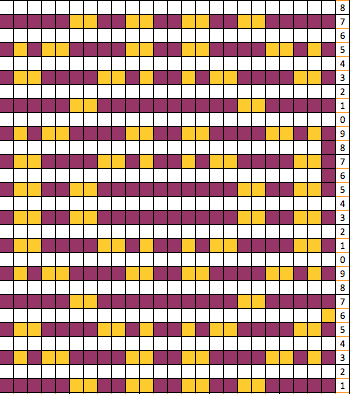 There are a number of ways to go on from this point. 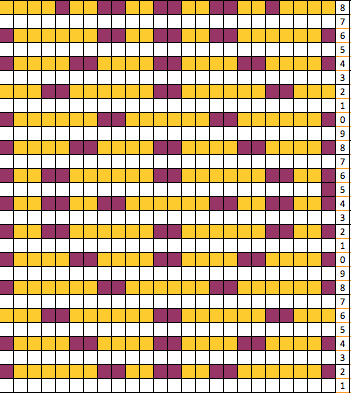 Layering the repeat on a colored ground can give a sense of the resulting shape, help plan the type of overall pattern repeat, and insure that enough rows are allowed to travel to and from the color changer. 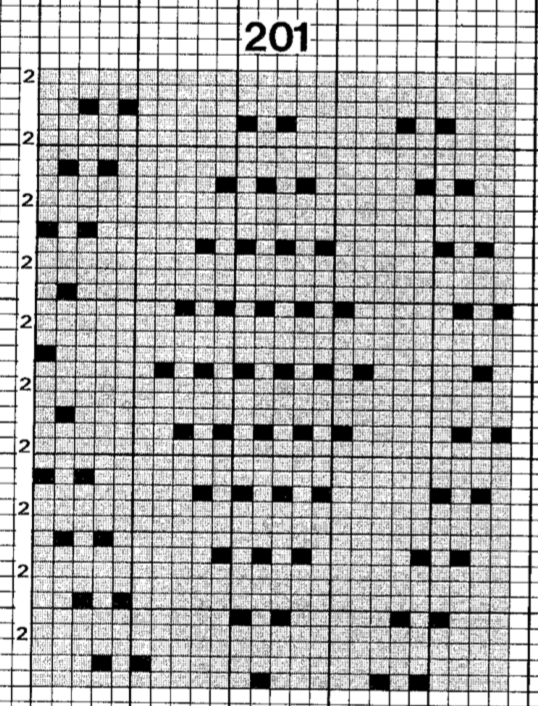 For sampling I prefer to work on an electronic machine, using the elongation feature and color reverse to minimize drawing in lots of black. 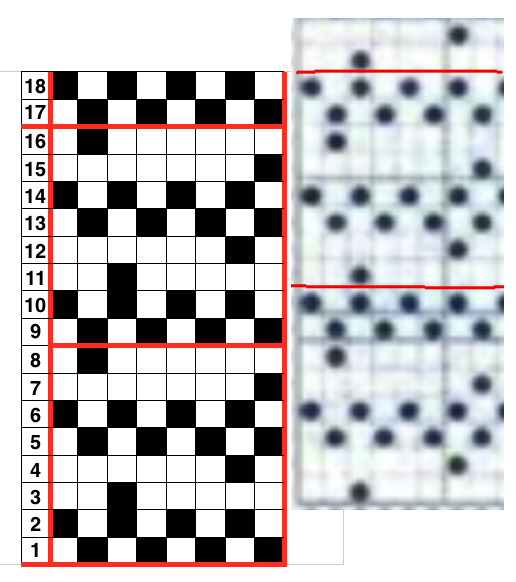 The grid on the left shows the above split motif layered over a striped ground. 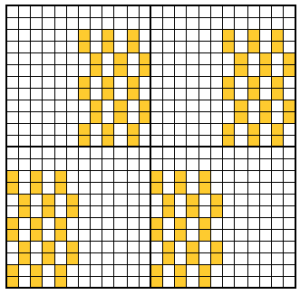 In the center grid, the motif separation color becomes white/ blank, color one (yellow) is different than on left simply to allow the white to become more visible. 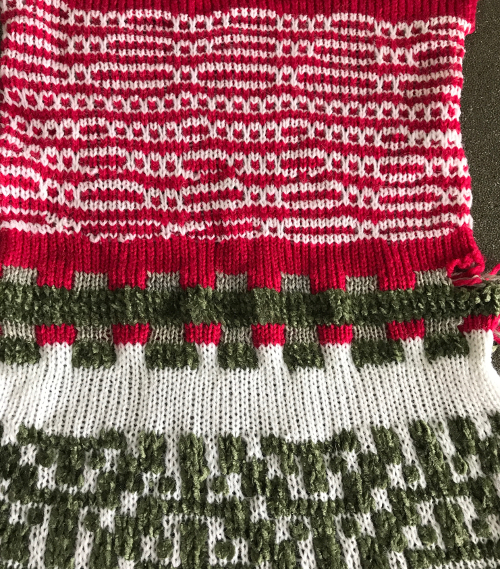 I use 2 carriages as opposed to the color changer when knitting these fabrics, so the L and R row markings help insure that indeed there are enough rows in the repeat for both carriages to travel to and from each side, with stripes lining up where required. 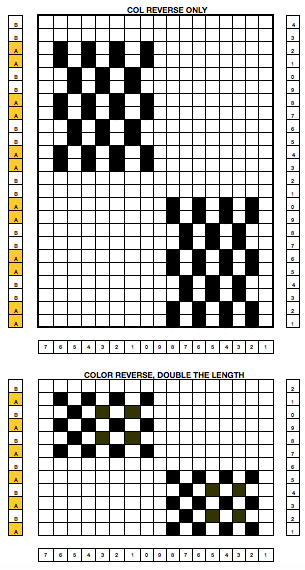 The blank squares represent slipped stitches, and they normally are left blank whether in a card, mylar, or program, all other colored squares are knit stitches, corresponding to punched holes, black squares on mylar. 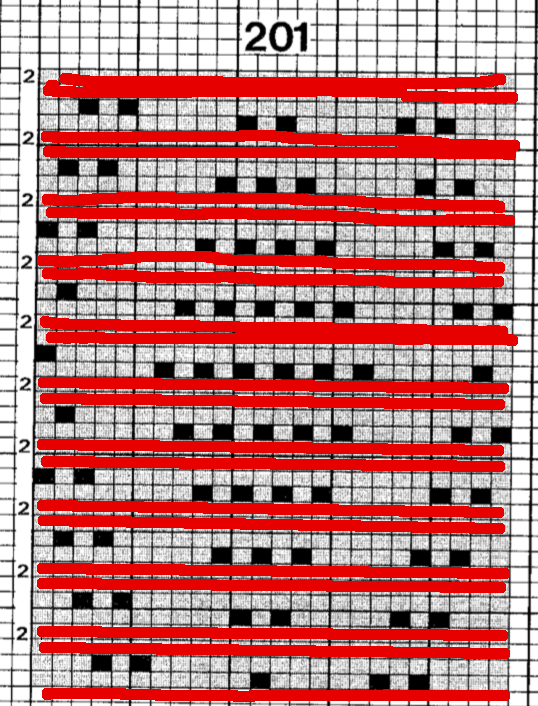 On the far right is all that is required to be filled in with a mylar sheet or program capable of lengthening X2 and color reverse. 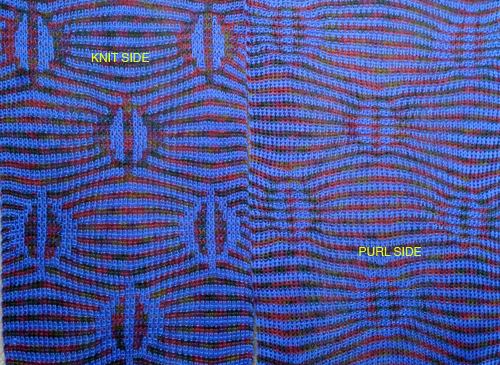 The marks are actually the same as the expanded motif first shown above. 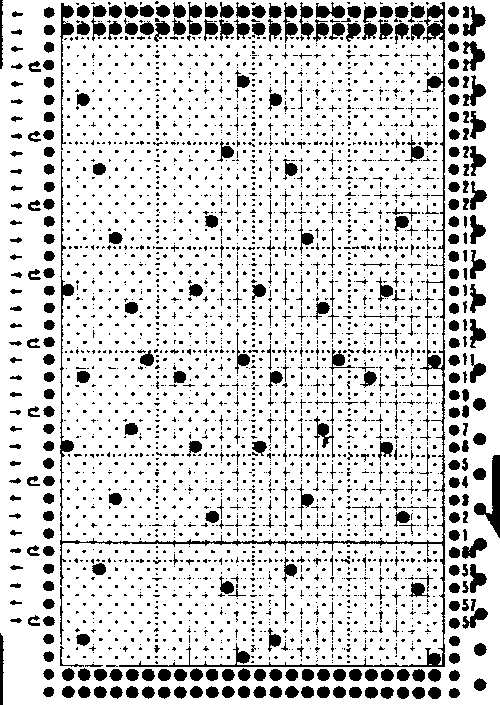 For a punchcard the same motif on the far right could be drawn this way centered, and every other square surrounding the now black lines would need to become a punched hole. 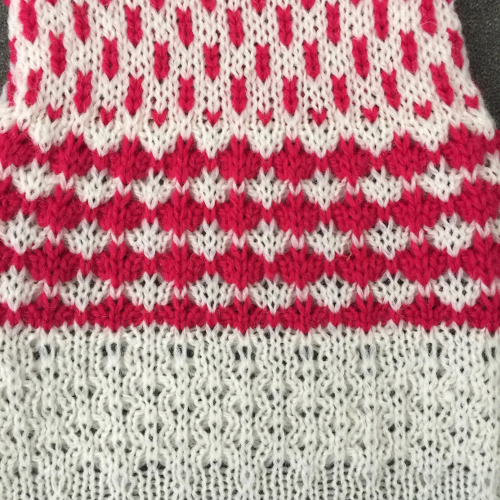 As for the motif that started this thread: below is the test swatch so far, obviously in a different gauge and repeat, but in the same spirit. 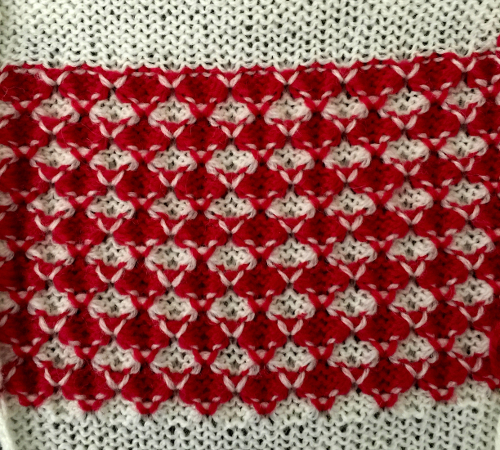 An issue is the long float on the back/purl side spanning 8 stitches. 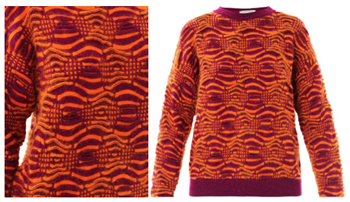 If the goal is to produce an unlined item, these could pose a problem in wearing it. 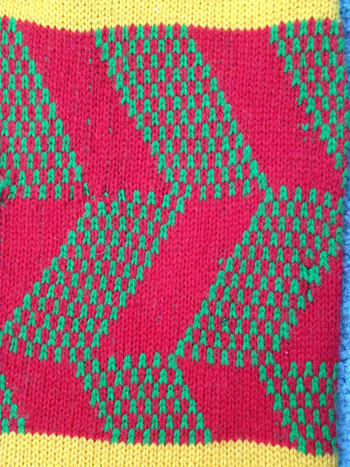 Hooking up the floats up may be too time consuming in production, an added stitch in the non motif color (see marked dots) on either side of the central bar may solve the problem, but alter the design. 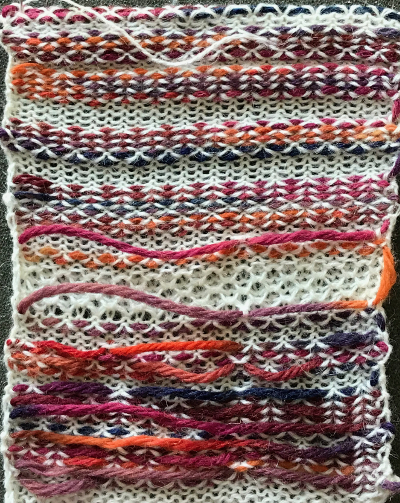 There is lots more to consider and play with (yarn colors in these swatches are chosen for throw away tests, not any type of final item) . 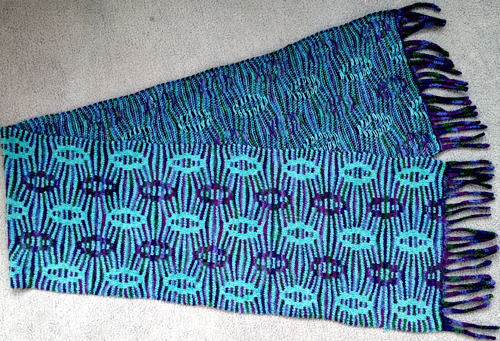 The final, new scarf fabric: knit on Passap, every needle rib, tencel and “Nomi Lee”. 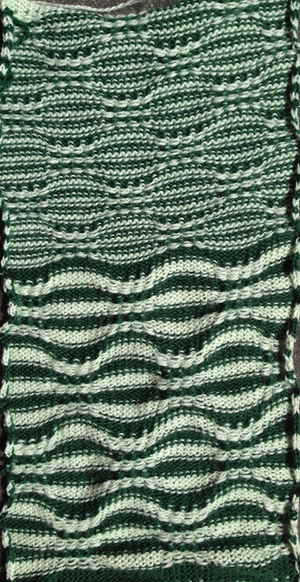 The top and bottom edging to be worked out; the fabric is soft, drapes well, and has no side curl.